Abstract: The recovery at Shi’bat Dihya 1 (SD1) of a dense Middle Paleolithic human occupation dated to 55 ka BP sheds new light on the role of the Arabian Peninsula at the time of the alleged expansion of modern humans out of Africa. 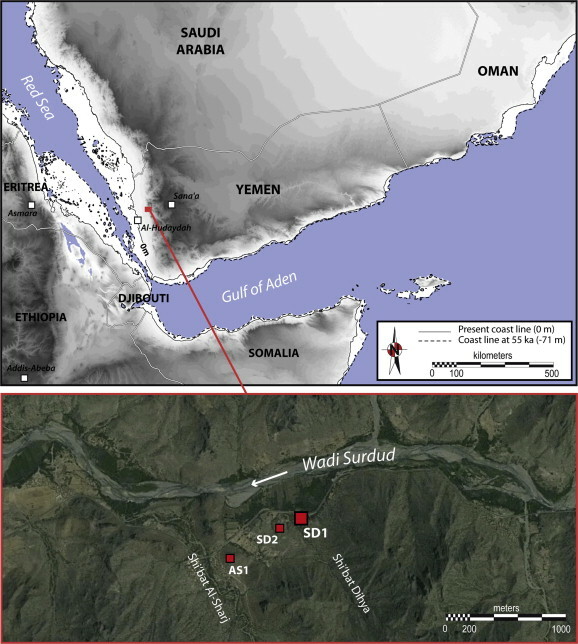 SD1 is part of a complex of Middle Paleolithic sites cut by the Wadi Surdud and interstratified within an alluvial sedimentary basin in the foothills that connect the Yemeni highlands with the Tihama coastal plain. A number of environmental proxies indicate arid conditions throughout a sequence that extends between 63 and 42 ka BP. SD1 cores (1–4: ‘narrow-sided’ cores; 5–8: cores exploited for the production of pointed flakes; 9: unidirectional convergent Levallois core; 10: unidirectional recurrent Levallois core; 11: centripetal recurrent Levallois core). The lithic industry is geared toward the production of a variety of end products: blades, pointed blades, pointed flakes and Levallois-like flakes with long unmodified cutting edges, made from locally available rhyolite. The occasional exploitation of other local raw materials, that fulfill distinct complementary needs, highlights the multi-functional nature of the occupation. 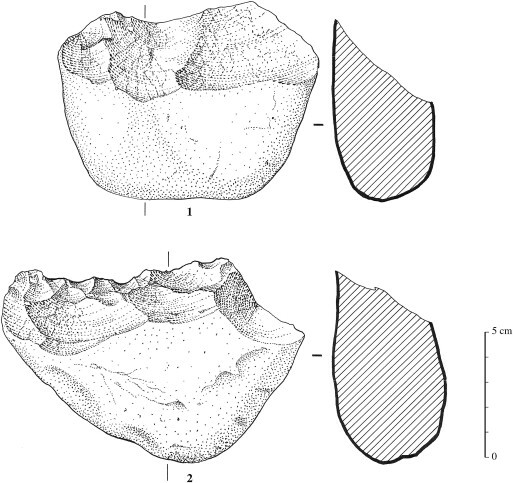 SD2 lithic products (1–4: pointed flakes, 5 and 6: blades, 7–10: quadrangular flakes, 11 and 12: unifacial centripetal cores); drawings by J.J. 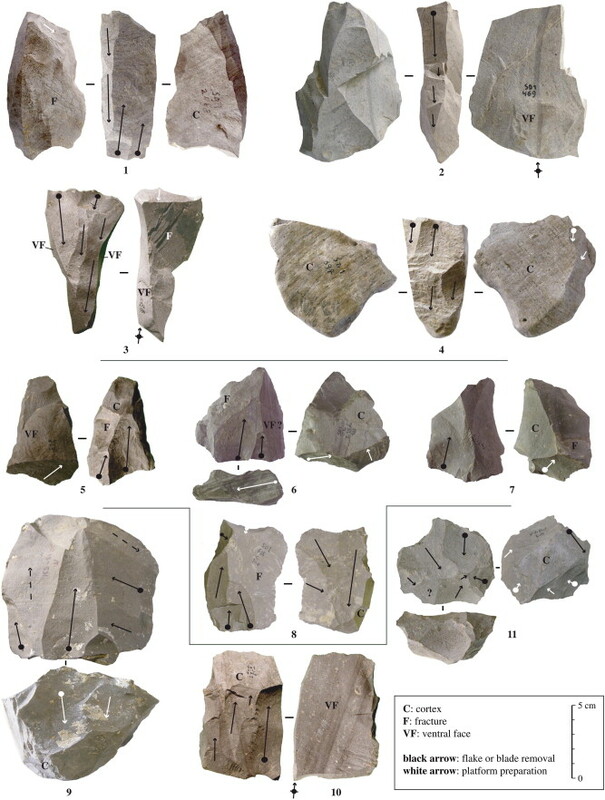 The slightly younger Shi’bat Dihya 2 (SD2) site is characterized by a less elaborate production of flakes, together with some elements (blades and pointed flakes) similar to those found at SD1, and may indicate a cultural continuity between the two sites. 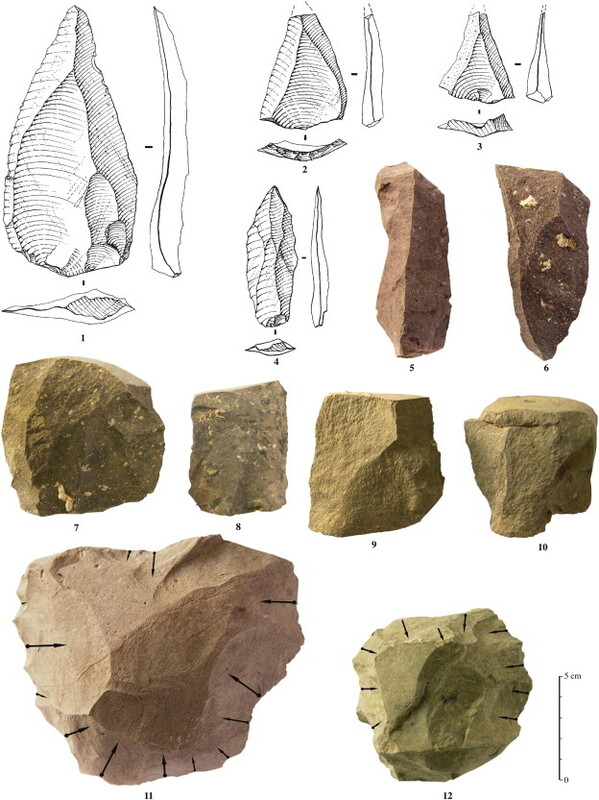 The technological behaviors of the SD1 toolmakers present similarities with those documented from a number of nearly contemporaneous assemblages from southern Arabia, the Levant, the Horn of Africa and North Africa. However, they do not directly conform to any of the techno-complexes typical of the late Middle Paleolithic or late Middle Stone Age from these regions. This period would have witnessed the development of local Middle Paleolithic traditions in the Arabian Peninsula, which suggests more complex settlement dynamics and possible population interactions than commonly inferred by the current models of modern human expansion out of Africa.